I took my degree and put it in the bottom of a box when POTUS was given that honorary degree. But, maybe, in the future, I shall dig it out again. Notre Dame renews lawsuit against Obamacare. Did you know about the mini-series on socialism and Deus Caritas Est? My mini-series on socialism and Deus Caritas Est may be found on the links below. It is clear that the grace of the sacraments leads one to perfection. 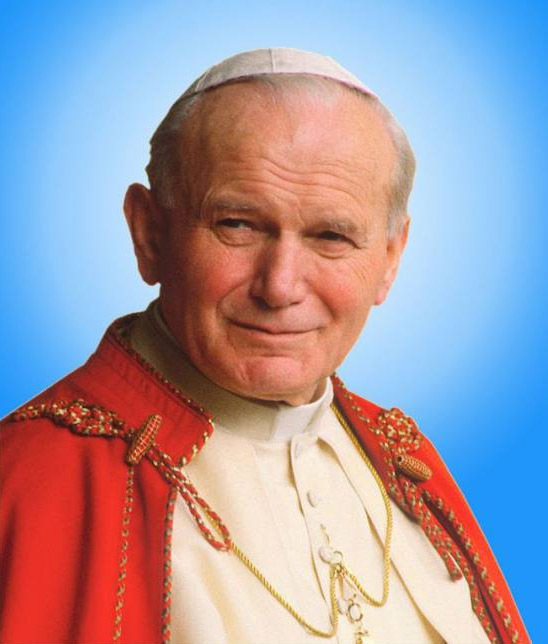 The Eucharist, states Blessed John Paul II, gives us both the power and the source of that complete gift of self. Christ gives Himself to each one of us and each one gives himself to Christ. Having become one with Christ, the Christian becomes a member of his Body, which is the Church (cf. Cor 12:13, 27). By the work of the Spirit, Baptism radically configures the faithful to Christ in the Paschal Mystery of death and resurrection; it "clothes him" in Christ (cf. Gal 3:27): "Let us rejoice and give thanks", exclaims Saint Augustine speaking to the baptized, "for we have become not only Christians, but Christ (...). Marvel and rejoice: we have become Christ! ".28 Having died to sin, those who are baptized receive new life (cf. Rom 6:3-11): alive for God in Christ Jesus, they are called to walk by the Spirit and to manifest the Spirit's fruits in their lives (cf. Gal 5:16-25). Sharing in the Eucharist, the sacrament of the New Covenant (cf. 1 Cor 11:23-29), is the culmination of our assimilation to Christ, the source of "eternal life" (cf. Jn 6:51-58), the source and power of that complete gift of self, which Jesus — according to the testimony handed on by Paul — commands us to commemorate in liturgy and in life: "As often as you eat this bread and drink the cup, you proclaim the Lord's death until he comes" (1 Cor 11:26). And, of course, as seen in the sections from St. John of the Cross and others, the seeking of perfection is rooted in love. Love demands perfection and perfection demands love. Such is the relationship between Christ and His Church, Christ and each one of us. 24. And so we find revealed the authentic and original aspect of the commandment of love and of the perfection to which it is ordered: we are speaking of a possibility opened up to man exclusively by grace, by the gift of God, by his love. On the other hand, precisely the awareness of having received the gift, of possessing in Jesus Christ the love of God, generates and sustains the free response of a full love for God and the brethren, as the Apostle John insistently reminds us in his first Letter: "Beloved, let us love one another; for love is of God and knows God. He who does not love does not know God; for God is love... Beloved, if God so loved us, we ought also to love one another... We love, because he first loved us" (1 Jn 4:7-8, 11, 19). Grace leads us to love and perfection. We become like Christ through this process. By the way, if someone is still confused as to natural law philosophy, the evil of "teleological", "consequentialist" and "proportionalist" ethical theories, and how a Catholic approaches moral issues, this encyclical provides excellent definitions and guidelines. There is much confusion among younger Catholics who have not had the advantage of good catechesis on these matters. Take advantage of the fact that this encyclical in on line here. Several readers have asked me questions about perfection which reveal a confusion on the call of Christ to all Catholics. Too many priests have watered down this call and have not taught the way to perfection. I am looking at Veritatis Splendor, by Blessed John Paul II to help in this regard. Bl. John Paul II notes that perfection is maturity. And the section on baptism helps answer the question which plagues the Protestants, who believe that all our sins are taken away at once forever, denying concupiscence and the need for the sacraments. First, this section, then another below. St. Augustine is aware of the battle for perfection. Yet, he attained this or we would not call him "Saint". And, as Garrigou-Lagrange and others have noted, the call is for all the baptized, who follow Christ in Truth. Here is Blessed John Paul II again. I answer that, For someone to redeem, two things are required--namely, the act of paying and the price paid. For if inredeeming something a man pays a price which is not his own, but another's, he is not said to be the chief redeemer, but rather the other is, whose price it is. Now Christ's blood or His bodily life, which "is in the blood," is the price of our redemption(Leviticus 17:11-14), and that life He paid. Hence both of these belong immediately to Christ as man; but to the Trinity as to the first and remote cause, to whom Christ's life belonged as to its first author, and from whom Christ received the inspiration of suffering for us. Consequently it is proper to Christ as man to be the Redeemer immediately; although the redemption may be ascribed to the whole Trinity as its first cause. Reply to Objection 1. A gloss explains the text thus: "Thou, O Lord God of Truth, hast redeemed me in Christ, crying out, 'Lord, into Thy hands I commend my spirit.'" And so redemption belongs immediately to the Man-Christ, but principally to God. Reply to Objection 2. The Man-Christ paid the price of our redemption immediately, but at the command of the Father as the original author. Reply to Objection 3. The sufferings of the saints are beneficial to the Church, as by way, not of redemption, but of example and exhortation, according to 2 Corinthians 1:6: "Whether we be in tribulation, it is for your exhortation and salvation. There is a twofold efficient agency--namely, the principal and the instrumental. Now the principal efficient causeof man's salvation is God. But since Christ's humanity is the "instrument of the Godhead," as stated above (Question 43, Article 2), therefore all Christ's actions and sufferings operate instrumentally in virtue of His Godhead for the salvation of men. Consequently, then, Christ's Passion accomplishes man's salvation efficiently. Reply to Objection 1. Christ's Passion in relation to His flesh is consistent with the infirmity which He took upon Himself, but in relation to the Godhead it draws infinite might from It, according to 1 Corinthians 1:25: "The weakness of God is stronger than men"; because Christ's weakness, inasmuch as He is God, has a might exceeding all human power. Reply to Objection 2. Christ's Passion, although corporeal, has yet a spiritual effect from the Godhead united: and therefore it secures its efficacy by spiritual contact--namely, by faith and the sacraments of faith, as the Apostle says (Romans 3:25): "Whom God hath proposed to be a propitiation, through faith in His blood." The Crucifixion was in the Will of God. God the Father allowed His Own Son to incur the just punishment or of our sins and those of all humans from Adam and Eve to the last person to live on earth. This great suffering, which only a God-Man could endure and take on Himself, as the One Who Is All Good, All Pure, All Innocence, will come upon the Church in the final days of tribulation. I do not know when this will happen, but I do know this. That a great suffering will come upon the Church soon. This is why I write so much. This is why I write on perfection and being in the Will of God. God will allow the Church to share in His Passion, which we do daily in the Mass. 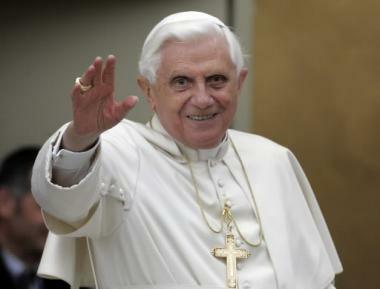 It is His Will that Catholics become saints and that saints bring others to Him through the Church. The evil which is gathering against the Church will not look evil to many. It will look like good. That many will be deceived is already obvious, as many are deceived now. When I attend the small Tridentine Masses here, as I did in England and in Ireland, I am struck by the smallness of the communities. I am struck by those isolated suffering people I met in Malta who are waiting for God without the TLM. When God allowed His Son to be Crucified, to be killed, God suffered as did the entire Trinity in some mysterious way. God, Three in One, will allow His Bride to suffer. The suffering of Christ is unique, but God the Father allows this suffering in His Plan. John 14:8-11 reminds us that the Son is in the Father and the Father is in the Son. That God the Father would allow suffering is a great mystery, but such was His Plan. ....For someone to redeem, two things are required--namely, the act of paying and the price paid. For if in redeeming something a man pays a price which is not his own, but another's, he is not said to be the chief redeemer, but rather the other is, whose price it is. Now Christ's blood or His bodily life, which "is in the blood," is the price of our redemption (Leviticus 17:11-14), and that life He paid. Hence both of these belong immediately to Christ as man; but to the Trinity as to the first and remote cause, to whom Christ's life belonged as to its first author, and from whom Christ received the inspiration of suffering for us. Consequently it is proper to Christ as man to be the Redeemer immediately; although the redemption may be ascribed to the whole Trinity as its first cause. The wanting of the sufferings of Christ does not mean that Christ did not take upon Himself all the sins of men and women of all ages. No. It means that in every age, there is a need for the Crucifixion to bear fruit among the people on the earth. It means that in every age, Christ is Incarnated, as He is Present in the Eucharist, in the sufferings of the Church. If we allow ourselves to be conformed to Christ, we shall be invited to join Him in His Passion. This is the mystery of the Passion. 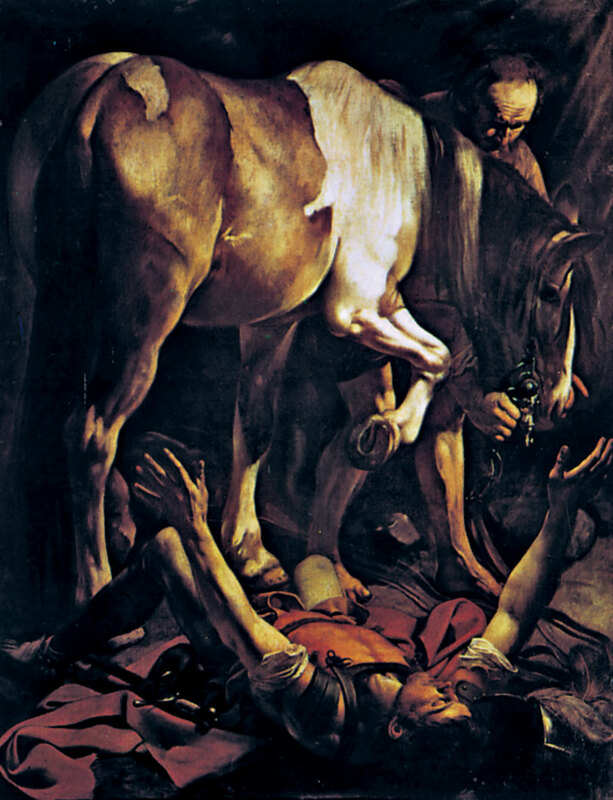 Many years ago, I saw the Caravaggio Conversion of St. Paul in Rome. What has struck me about this painting is that Paul is on the ground, on the road to Damascus, but his body is in the shape of the Cross. It is as though St. Paul is reaching out to the Crucified One already, in imitation of Christ's sacrifice. This perspective is different than the heresy of "patripassionism" which is connected with modalism and states that God the Father died on the Cross. Of course, this is not true. But, God did suffer and St. Paul states this. "God was in Christ, reconciling the world to Himself" (2 Cor 5:19). We cannot say that Christ was ever separated from the Trinity. There is a mystery here and a mystery for the Church. We can say that God gave us His Son and did not spare the One He Loves. As observed above (Article 2), Christ suffered voluntarily out of obedience to the Father. Hence in three respects God the Father did deliver up Christ to the Passion. In the first way, because by His eternal will He preordained Christ's Passion for the deliverance of the human race, according to the words of Isaias (53:6): "The Lord hath laid on Him the iniquitiesof us all"; and again (Isaiah 53:10): "The Lord was pleased to bruise Him in infirmity." Secondly, inasmuch as, by the infusion of charity, He inspired Him with the will to suffer for us; hence we read in the same passage: "He was offered because it was His own will" (Isaiah 53:7). Thirdly, by not shielding Him from the Passion, but abandoning Him to His persecutors: thus we read (Matthew 27:46) that Christ, while hanging upon the cross, cried out: "My God, My God, why hast Thou forsaken Me?" because, to wit, He left Him to the power of His persecutors, as Augustine says (Ep. cxl). Reply to Objection 1. It is indeed a wicked and cruel act to hand over an innocent man to torment and to death against his will. Yet God the Father did not so deliver up Christ, but inspired Him with the will to suffer for us. God's "severity" (cf. Romans 11:22) is thereby shown, for He would not remit sin without penalty: and the Apostle indicates this when (Romans 8:32) he says: "God spared not even His own Son." Likewise His "goodness" (Romans 11:22) shines forth, since by no penalty endured could man pay Him enough satisfaction: and the Apostle denotes this when he says: "He delivered Him up for us all": and, again (Romans 3:25): "Whom"--that is to say, Christ--God "hath proposed to be a propitiation through faith in His blood." Reply to Objection 2. Christ as God delivered Himself up to death by the same will and action as that by which the Father delivered Him up; but as man He gave Himself up by a will inspired of the Father. Consequently there is no contrariety in the Father delivering Him up and in Christ delivering Himself up. Reply to Objection 3. The same act, for good or evil, is judged differently, accordingly as it proceeds from a different source. The Father delivered up Christ, and Christ surrendered Himself, from charity, and consequently we give praise to both: but Judas betrayed Christ from greed, the Jews from envy, and Pilate from worldly fear, for he stood in fear of Caesar; and these accordingly are held guilty. Etheldredasplace: What is detachment from venial sin? In the long Dark Night of the Soul series, found through the labels at the side of this blog, I noted that the great saints teach us that Faith must be purged of the reliance on the imagination. Some readers asked good questions on this point and I hope I answered some queries. However, I want to expand on this idea today, as we are quickly entering into a time where any type of consolation of faith may be taken away from us, both as individuals and as a group. I think of those who survived the concentration camps of Germany, or the Gulag of Russia, or even, of Frodo, in literature, who told Sam on Mt. Doom that he had forgotten what the Shire looked like. In the face of grave isolation and in the midst of the enemies of the Church, one could forget the consolations of the sacraments and the Mass. One could be separated from the liturgical comforts of the great feast days and the days of the saints. One could be removed from all physical beauty, and even from the memory of such beauty. What happens in the Dark Night, in this purging of the imagination, is the complete destruction of intellectual and emotional input, but a slow changing of both to be born again in the Mind of Christ. The intellect finally conforms to that of Christ's Mind, which sees all things in a different light than the world, the flesh or the devil. The emotions are purged of selfishness. The will is changed from being centered on self to being centered on God alone. When one is in a desert, one sees mirages instead of reality. One must learn to trust something more than the senses. One must learn to trust in the deep recesses of the self, which hopefully rests in God. The self-will is gone. That forceful push to the inner being of a person, that harsh glare of reality beyond fear and expectation, is the final stage in the Dark Night. There, if one is quiet and listening, one will finally encounter God as He wants to be encountered, not as one imagines Him to be. Like the person in the concentration camp who only sees violence and ugliness day after day, but hopes in the Unseen God, the person in the Dark Night transcends the ugliness of his own sin and tendencies towards sin. One may ask how Love is found in this dark passage from self to nothingness. Love seeks and finds. And, finally , one realizes that one can only rely on that Love and nothing, no one else. If God decides to take all away, so be it. If He decides to bless, so be it. In the next state, that of Illumination, one will finally come to understanding. But, until then, one waits in faith, hope and love. One must decide to live in the Shadow of God, rather than in the false bright lights of the world. This living both in the world but not being of the world is the call of each Catholic. If you are feeling now that you do not "belong" anywhere but with God and His True Church, be glad. If you are abandoned by those in the world, and even by some Christians, do not be alarmed. So, too, was Christ. You are moving into the great Darkness which will lead you to a greater encounter with God.